Well it took about a week, but I got the last of the back splats laminated this weekend. I still have to mill the edges of each splat square and then round them on the router table. To be honest, I'm tired of working on the splats, so I'll finish them up later. Here's some pictures of the rough splats all spaced out (don't pay attention to the extra "mistake splat"). Laminated back splats with rough edges. Now that I have a jointer capable of flattening 12" wide boards, I no longer had an excuse to put off working on the rear legs. I milled the 9" wide board flat on one side with the jointer; then took it down to 1 3/4" thick with the planer. Next, I used the rear leg template to trace the shape of the rear legs onto the board. Rear legs traced onto board. 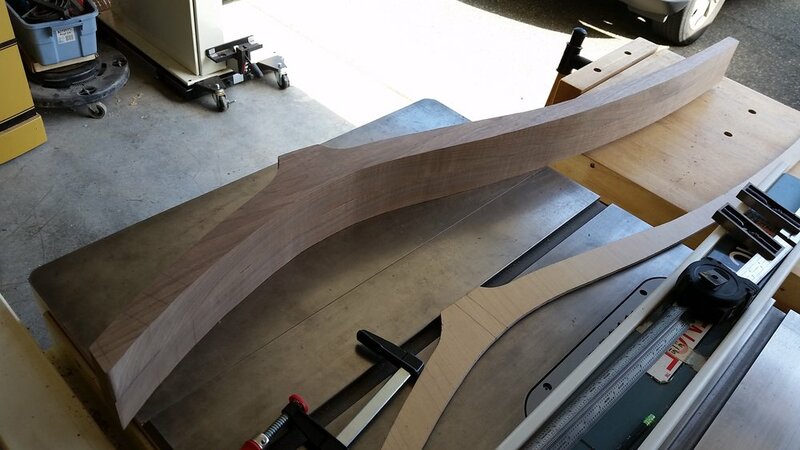 Then I got to spend some quality time on the bandsaw to cut out all of those curves. 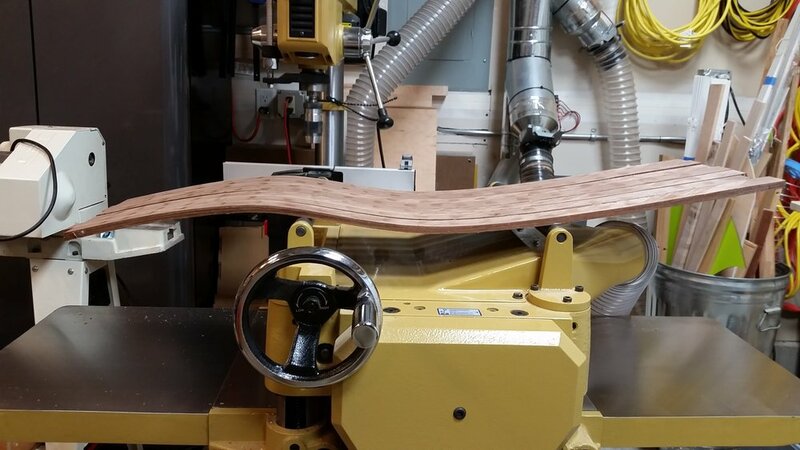 The tight curves near the seat joints were a little difficult to cut with my 3/4" bandsaw blade, but I made it work. Seems like a good excuse to order a 1/4" blade, right Katie??? Rear legs rough cut to shape. Rear legs: Left one has rough bandsaw marks. Right one has been sanded on spindle sander to remove bandsaw marks. Now I need to build a jig which will let me cut the seat joint at just the right angle. I wasn't going to have time to build the jig tonight, so I decided to move on to the seat boards. Remember my hours and hours of layout on the rough boards? The countless chalk layouts to ensure that I got the perfect section of board for each chair part? Well, wouldn't you know it, I got it wrong. I flattened the three boards that will make up the seat and had them sitting next to each other on my bench. Something just didn't look right. I had two 8" wide boards and one 9" wide board, so obviously the 9" board was cut from a different board than the 8" boards. The problem was that the 9" board was significantly lighter in color than the 8" boards. I just knew that it would bug me every time that I looked at the chair if I didn't change it. Luckily, I bought some extra boards, so I was able to swap out the 9" board for one with a better color match. I had enough time to cut the three boards to the proper width before calling it a night. Next on the to-do list will be cross-cutting the seat boards and cutting the joinery to receive the front and rear legs, prior to gluing the three seat boards together.